According to the Department of Transportation, as many as 4,280 pedestrians lost their lives and a further 70,000 were injured in traffic accidents in a single year, which breaks down to a pedestrian fatality every two hours and an injury every eight minutes. Although collisions between motorists and pedestrians can occur just about anywhere, Florida’s metro areas are notorious for their high rate of pedestrian fatalities, so if you were injured in a pedestrian-motorist collision in Florida, please contact one of our dedicated pedestrian accident attorneys for a free case evaluation and an explanation of your legal options. 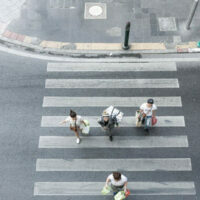 Why are Pedestrian Accidents so Common? The latter is especially common in these types of cases, and can continue to afflict those who were injured in collisions with motorists long after their physical injuries have healed. In severe cases, injured parties may even be required to attend therapy and take prescription medications, which can take a heavy financial toll over time. Fortunately, these costs, as well as those related to treating a person’s physical injuries are all compensable if the injured party can demonstrate that a motorist was the cause of his or her accident. In fact, injured pedestrians could also be eligible to recover compensation for lost wages, loss of future income, and pain and suffering. Abiding by all traffic rules. Unfortunately, not all drivers follow basic safety rules and not all pedestrians use the utmost care when crossing at intersections and crosswalks, which results in thousands of collisions between pedestrians and motorists every year. To speak with one of the experienced Fort Lauderdale pedestrian accident attorneys at Boone & Davis about your own injuries, please call 954-566-9919 today.